Home > Cattle > Rate of decline declines. 31 Aug Rate of decline declines. 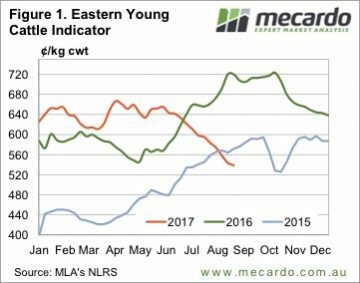 Last week Mecardo looked at when the Eastern Young Cattle Indicator (EYCI) might find a base after a long fall. While prices still eased this week, the rate of decline has slowed, suggesting some support might be found soon. Technical analysis isn’t a strongpoint, but we do know that when the pace of a rally, or a decline, slows, the market is usually getting close to changing direction. Over the 12 weeks to last Friday the EYCI has fallen 112¢ at a rate of 9.3¢ per week (figure 1). This week the EYCI lost ‘only’ 4.75¢ to hit yet another 22 month low of 538.75¢/kg cwt. At a dressing percentage of 54%, the EYCI currently sits at 291¢/kg lwt. 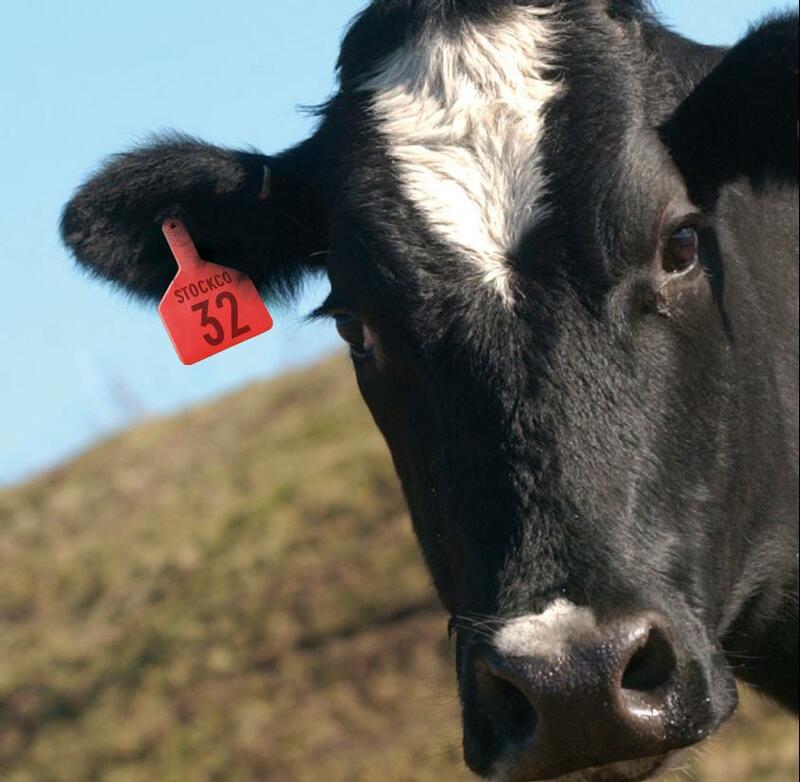 The National Trade Steer Indicator sits at 299¢/kg lwt, while the National Feeder Steer Indicator is at 300¢. With both Trade and Feeder steers at a premium to the EYCI, it suggests restocker type cattle, and heifers are discounted to the EYCI, to drag the average down. Cattle prices were generally lower despite the weakest yardings for a full week in 11 months (figure 2). 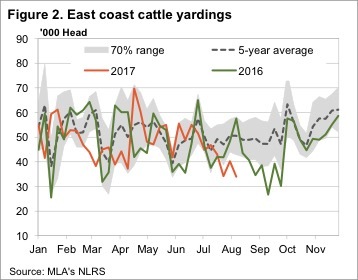 It’s interesting to note that at least in the yards cattle supply has been on the decline for nearly two months, and now sit well below last year and the five year average. Weakening prices amid weakening supply is a pretty good indicator of weaker demand. For young cattle we can blame restockers, who have pulled back after driving the market for two years. For finished cattle the abundance of cattle on feed is helping to keep a lid on finished cattle values. With no real precipitation on the forecast, it’s unlikely we’ll see cattle prices rising any time soon. We do think that we’re likely to see some support soon, and cattle prices tracking sideways for a period. From there we will be looking for a northern wet season to kick-start the market, with 10% upside achievable.